The chinchilla (Chinchilla lanigera) originated from the Andes mountains of South America. The Spaniards named the animal Chinchilla, which means “little chincha,” after the Chincha Indians who use the pelts to decorate their ceremonial dress. Chinchillas are known for their soft and luxurious fur, and they have nearly been trapped to extinction in their native countries. In the United States there are now over 3000 ranchers and growing populations of pet chinchillas. Their average life span as pets is 10 years of age, but up to 20 years has been reported. The female, averaging 500 to 600 grams, is a little larger than the male at 400 to 500 grams. The gestation period is very long (111 days) which gives rise to very precocious young that are fully furred with teeth and open eyes at birth. They are able to walk within one hour of birth and are eating solid food at one week of age. As with rabbits and guinea pigs, the chinchilla’s teeth grow continuously throughout life. Their digestive tract is VERY long, and is specialized for digesting large amounts of fiber. Chinchillas are quiet, shy and rather high-strung pets. If handled frequently at a young age, chinchillas adapt well to humans. But in general, their characteristics make them better suited as pets for older children or adults. They are most active at dusk and at night. In captivity they seem to adapt well to our schedule and become more active during the day. They are agile, fast, and enjoy jumping and climbing. Chinchillas flee and run as their defense; they rarely bite. But they will chew on inanimate objects. They are extremely fastidious and virtually odorless. They must take dust baths to maintain their healthy fur. If frightened or picked up roughly they may shed large patches of fur. This condition is called “fur slip,” and a missing area of fur can take months to be indistinguishable from the surrounding areas of fur. Like guinea pigs, but unlike other mammals, female chinchillas have two uterine horns and two cervices. Males do not have a true scrotum, but rather the testes are contained within a pouch, just outside the abdomen. Chinchillas can breed all year long, but deliver their young most frequently between November and May. They reach sexual maturity at around 8 months of age. For breeding purposes, chinchillas may be housed as pairs or in polygamous units. Breeders set up the cages so that females have separate cages and males can freely run between the cages in a common runway where they can go into an open door to a female at will. Since the female can becomes very aggressive during breeding season, she wears a collar that prevents her from exiting the cage. This way, the male can escape without being injured. Other concerns include the size of the chinchillas and color. Gestation is about 111 days and the female will usually give birth to two young. Birthing usually occurs during the morning, and problems rarely occur. Curiously, chinchillas eat the placenta of their young. The young are born with open eyes and ears, and are fully furred and have teeth. The young will begin eating solid foods by two weeks of age. Chinchillas are fastidious groomers and instead of water, they require a special dust for bathing. Access to dust baths should be provided 15 minutes to an hour daily. 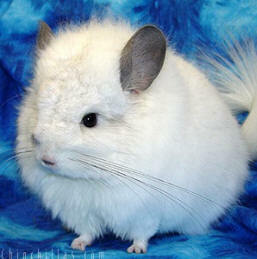 Use a commercial chinchilla dust bath such as Blue Cloud or Blue Sparkle. Playground or beach sand is not suitable for dust baths. Place 1 inch of the dust in a flat dish that is large enough for the chinchilla to roll in. The bath should not be kept in the cage at all times, because it maybe used as a litter box, or more likely, the constant exposure to the dust can cause inflammation or infection to the eyes or eyelids (conjunctivitis). A lot of space is necessary to house these acrobatic animals. Since they like to climb and jump in both horizontal and vertical directions, a large multilevel cage is recommended. Ideally, the larger the cage the better. The cage should be constructed of a very small welded wire mesh to prevent leg or foot injury. An area of solid flooring should also be available. Drop pans below the cage are ideal for facilitating cleaning. Since chinchillas are shy animals, they need a place to hide. Non-destructive boxes work well. Use something that is non-porous and can be cleaned and sanitized well. A chinchilla’s native habitat is dry and cool. This type of weather should be mimicked in captivity to ensure a healthy pet. High temperatures and high humidity should be avoided year round. Environmental temperature at or above 80 degrees Fahrenheit coupled with humidity will lead to heat stroke. A recommended temperature range is 50 to 68 F.
Free ranging chinchillas survived in barren areas of the Andes Mountains. They fed on dry grasses, leaves and bark of small trees and shrubs. Their very long and efficient digestive tract and continuously growing teeth are well equipped for this type of diet. Nonbreeding, adult pets do very well on a diet of high-quality grass (timothy hay) and a small amount (1 to 2 tbsp) of chinchilla pellets. Alfalfa hay is not recommended due to its high calcium content relative to phosphorous ratio, which may lead to kidney and bladder problems. A diet of only pellets is deficient in fiber and will lead to digestive problems, which are life-threatening in a chinchilla. An accepted formula for chinchilla pellets is 16 to 20 percent protein, 2 to 5 percent fat and 15 to 35 percent bulk fiber. A very small amount (1 teaspoon) of grains, dried apples or hazelnuts can occasionally be offered as a treat. These should be prepared as if for human consumption, and should be introduced gradually to prevent any stomach upset. In addition to hay, other hard foods may be used for gnawing and proper tooth wear. Young, non-chemically treated branches of maple and birch trees, or pieces of bark from apple, peach and pear trees may be offered. Do not use branches from poisonous trees such as cherry, oleander, cedar, plum or redwood to name a few. In general, chinchillas are hardy and suffer few illnesses. Your new chinchilla should have a check up by a veterinarian within 30 days of purchase and then annually thereafter. Your veterinarian may detect slight abnormalities that may need to be addressed. There are no vaccines currently available for use in chinchillas. Always provide excellent nutritional and sanitary conditions. This is the BEST preventive care you can provide for your chinchilla. © 2006-2019 AnimalPets.org. Page generation 0.000 seconds.